To learn more about this yearlong adventure with Gladys Taber and Rachel Peden, you may scroll down to the 'letter topics' and click A Year with Gladys and Rachel. September begins and ends so differently. I often feel energetic and hopeful at the start, and a bit pensive and introspective as it ends. Gladys' September chapter is decidely on the pensive side. She notes a few observations from the natural world but most of her writing is concerned with more philosophical leanings. I think this isn't unusual for her. Though she is a country woman, her housemate Jill does most of the actual yard and garden work. Presumably this is because Gladys was busy with her writing. She does picnic and swim and walk and dream outdoors, but she always thinks and thinks, and shares her thoughts with us. Seeing the school bus, she ponders the difference in school lunches since she was a child. She writes about a school in Mississippi which she supports. I looked it up and it is still in existence - The Piney Woods School. She ponders the conditions of the world and the place of education in that world. She defends the work that teachers do, and bemoans the small salaries. Some people think teaching is such an easy job, it doesn't deserve the pay of say a bricklayer. Or a laundry delivery-man. Besides, look at those long vacations! Now this long vacation is another thing. This is the time when teachers should be studying and doing research and refilling the well of inspiration. Instead of that, many teachers work. I know of men teachers who do carpentry, hire out as painters. Some clerk in grocery stores. Women tutor or do secretarial work or act as companions to elderly folk. The summer work experiences may be different now, but there are still a whole lot of teachers who must work in the summer. Even Tom, who doesn't hold a paying job in the summer, spends the long days doing work that we would have to pay someone to do (and hence would not get done) if he didn't. He definitely gets recharged for the school year but it is in doing manual labor outdoors, not in 'refilling the well of inspiration.' I think he read one book all summer! As I've said many times, the joy of reading older books is in seeing how social and political life was then. Gladys said something that startled me. When I read about the inter-collegiate debates and that several colleges withdrew their teams as soon as the subject was stated "We should recognize Red China," I was too shocked to speak. One president said quite plainly that he feared if his team drew the positive side, fifteen years hence one or more of its members might be investigated as subversive. She ponders why sorrows and troubles afflict us, but is centered and consoled by her home place. The night is full of dreams, as only a September night can be. I feel as if I could hold life in my hand, distilled and crystallized like a special jewel. Here is all the loveliness there is, all the peace, all the joy, all at once realized. Such moments come rarely and come completely. I could, I feel, gather a bouquet of stars and put them in a milk-glass swan compote and they would be there forever. And this describes the woman perfectly. She thinks the 'big thoughts' but is practical and down-to-earth at the same time. Gladys Taber is a constant joy to read. If you haven't met her yet, she could change your life for the better. I know she has changed mine. As I said last month, Rachel Peden begins the book with September. A farm year has, actually, no beginning and no end. Like an old-fashioned roller towel, it begins any place a farmer can get a hold of it. Moving to a new farm, he tries to get there by the first of March, to start his spring work. Or he goes in the fall, having sold all the corn and hay, machinery and livestock he can spare, and leaving the last of the garden to its weedy fate. But for farmers who have children in school, the year begins when school begins. ... a new routine settles down over the farm. Farm kitchens are fertile with bushel baskets of green beans, tomatoes, cucumbers, cabbage, corn, or flat baskets of purple or green grapes, all to be got ready for freezer or pressure canner. A farmer bringing in the morning milk is likely to find the kitchen floor carpeted with corn husks, and from the hog lot comes the happy, gluttonous chompings of hogs stowing away the milky, close-shaved cobs. By these signs the farmer knows freezer and cellar are waxing full. At noon he will know it even more. He can tell by whatever is in the big, fluted, white ironstone dish just what phase the canning moon is in. In the sign of the green bean, dinner will be green beans and bread and butter. The next day, crescent in the corn phase, dinner will be roasting ears and bread and butter. The third day, in the sign of succotash, dinner includes sliced tomatoes. After so long without pie, a farmer waxes hungry. Even so, he fares better in the canning moon than in the house-cleaning moon, in which there is no assurance even of bread and butter to eat. The song of the cricket is said to instill a note of content into a house. It does, of course, if you are the cricket. It does also, to some extent, if you consider that the voice of the cricket in today's complex world is just the same as it was in an earlier American era, or even in a much more remote civilization. ... The voice of the cricket is a theme of reassurance carried from an ancient civilization into our modern one. If I ever have to dive for survival into an underground shelter, I hope there will be a cricket familiarly "ye-up, ye-up, ye-upping" there. As with Gladys in her passage about the debating, here is Rachel writing of 'underground shelters.' I fear that we all look back at the middle 1950s into the early 1960s as a peaceful, less stressful time. It wasn't. Just as in another sixty years, people will probably look back at our time as such. When you read a book set in the time, you see how people thought and lived then. People have been happy and worried, contented and fearful always. And this can give us great consolation. I know it consoles me, and gives me a sense of peace in my own time. Rachel goes on to muse about 'sinkholes,' what we might call 'dumps,' on the farm. Farmers are reluctant to abandon anything irretrievably. They say "it might come in handy sometime" and let everything accumulate in tool shed, warehouse, or barn until finally a Time comes. ... The sinkhole is ringed with items abandoned on this comforting policy. Our barn serves this purpose for things that could be useful and are not quite useless yet. But outdoors, up the road and barely hidden, are such things as our old red mailbox - which was actually featured on the blog a couple times, here and here. It may be rustic and appealing but it leaks. or the tiller which served us well for ages, but which we shall never use again now that we have raised beds in the garden. Tom's thought is 'well, Matt might need it.' I don't think so. They've begun their gardening lives with raised beds, saving themselves the stress and strain and plain hard work of tilling. or the worst of all, this old wooden garden cart that frankly I didn't even know was there until I went exploring to take these photos. It is growing into the land. I can't imagine what Tom is thinking, but somewhere in his head, like inside Mr. Peden's, there is the idea that maybe, just maybe there shall be a use in some far future time for a rotten wooden cart. Which connects me to all those years ago when Rachel was alive and writing about her farm in Indiana. And makes me happy. Short Stories on Wednesdays is a weekly event hosted at Bread Crumb Reads to encourage people to read at least one short story a week. Whistle for the Wind, fourteenth story. First published in Good Housekeeping July, 1991. Flowers In The Rain & Other Stories published 1991.
and as Wednesday draws near I begin to wonder what I will read. Sometimes I pick up a book, find a story, and know immediately that this shall be my selection. But sometimes a day like today happens. I have been irresolute and unsettled all day. I'd go to the shelf, pick something up, begin a story, and put it back on the shelf. I tried Hemingway. I tried Ngaio Marsh. I read a bit of Katherine Anne Porter and Irwin Shaw and Kay Boyle. Then I stopped and thought, well, I guess no story this week. But then I saw Rosamunde Pilcher's Flowers In The Rain, and thought that's where I want to be - inside a Rosamunde Pilcher story. And so, even though I offered one by her a month ago, I'm offering another today. Maybe I'll write about a Pilcher story on the last Wednesday of every month. I begin to think that I like her stories even better than her books. I'm not sure why. Maybe it's just because I love these stories so much. I think I mentioned that I've read the whole book before, but it has been quite a few years. "Too still for fish. We'll need to whistle for the wind." Now Fergus has become engaged to a television actress, and bought a flat in London. What could you do about a man who had been part of your life since you were a little girl ... and finally turned out to be - she knew - the only man she could ever love? "Born and bred. I even went to school here. I was in Edinburgh for the winter but it's heaven to be back." To which Rose replies, "but you can't stay here for always." If you've ever read even one Rosamunde Pilcher book you know that Rose is wrong. Jenny is as much a part of the land as her beloved river. There is some conflict in the story, but the reader is very sure it will all work out in a most satisfactory way, and it does. A lovely, calming, uplifting story. I loved it. This book is a treat for dog lovers! So often we avoid a book that has a dog in it for fear the dog might die. But in this book Bob, a wire-haired terrier is the star of the show! He's not in it too much but when he is, he just shines! In fact, his game of rolling a ball down the stairs for a human to catch and throw back up to him is perhaps the cause of Emily Arundell's fall. … outside the front door - his own particular 'out all night very ashamed of himself' bark, pitched in a subdued key but repeated hopefully. We had a fellow like that. His name was Oreo, and he was part springer spaniel and part beagle. Many a night we'd fall asleep with the sound of his howling in the woods, and were awakened with his barks asking to be let in please, I'm tired. 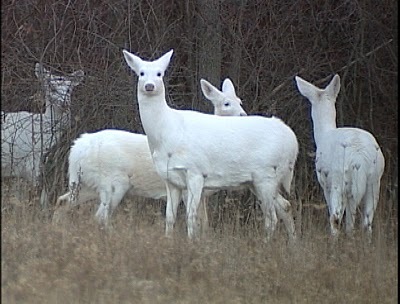 The dear boy died in January, 2003 a month shy of his 14th birthday. Here are a couple Bob-isms from the book. The terrier had continued to bark in some sequestered spot. Now the sound suddenly increased in volume. With a crescendo of barking he could be heard galloping across the hall. Bob, indeed, having discovered the intruders, completely changed his manner. He fussed in and introduced himself to us in an agreeable manner. This last was addressed to me as I stopped and patted him. The 'me' is Hastings. Bob has a different response to Hercule Poirot. Bob was now investigating the legs of Poirot's trousers. Having learned all he could he gave vent to a prolonged sniff (H'm, not too bad, but not really a doggy person'). 'Woof,' said Bob in energetic assent. The events which I have just narrated were not, of course, known to me until a long time afterwards. But by questioning various members of the family in detail, I have, I think, set them down accurately enough. Poirot and I were only drawn into the affair when we received Miss Arundell's letter. This letter arrived toward the end of June, but was dated April 17, and Emily Arundell died on May 1! 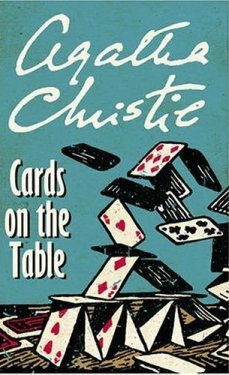 says it is 'not one of Christie's best,' I am exceedingly fond of Dumb Witness. Of course Bob is a fun addition to the cast of characters, but I also found it a realistic and disturbing view of this particular family. She is a very good judge of character, reminding the reader a bit of her fictional sleuth Miss Marple. I get the impression that Agatha Christie did a lot of observing in her encounters, and that she really paid attention. I felt so badly for Emily. Her nieces and nephews are such money-grubbers, barely caring for their old aunt other than as a bank. To herself, Emily Arundell admitted what she would never have admitted to another human being, her dissatisfaction with the younger generation of her family. Emily wrestles with a serious conflict. Is blood really thicker than water, metaphorically speaking. Should she leave her money to these greedy, unloving relatives? A very sad state of affairs. And a very good mystery story. Hey, could you ask a few students what they think 'dumb' means? I'm curious to know if the old meaning - 'unable to speak' is still known? Class's first reaction is 'stupid.' They don't think of the word dumb meaning unable to speak unless I say what about 'deaf and dumb.' Then they come up with the definition of not being able to speak. Scientific method huh? Class of 15. 8th grade. Please visit Beth Fish Reads for more food related postings this weekend. As fall begins, what better to bake than a coffee cake with cinnamon and chocolate chips? This recipe comes from the latest Penzey's Catalogue. It was fun putting it together last evening looking out the window at the orange and red in the trees - just the most beautiful, vibrant colors. I've never been able to capture them in a photograph, nor have I ever seen a picture in a magazine that could show how lovely the color really is. Add sour cream and vanilla and mix well. Add gradually to the butter mixture. Pour half the batter into a greased 9x13 pan. In a small bowl combine 1/4 cup sugar and 1/2 teaspoon cinnamon. Sprinkle half of the cinnamon/sugar mix and half of the chocolate chips over the batter. Spoon the remaining batter on top, and sprinkle with the rest of the cinnamon/sugar and chocolate chips. Cool in the pan on a cooling rack. Oh boy, is this ever great! You'll love it, I promise. For me, a good sign that a series is going to go the distance is when the second book is as good as the first. Through The Grinder is an excellent installment in the Coffeehouse series. It is darker and more disturbing than On What Grounds. The murderer stakes out the prey, and the reader sees it happen. This killer is full of hatred and venom toward the victims. Two women customers at the Village Blend commit suicide one after the other. I was pleased to see that the policeman we met in On What Grounds, Detective Quinn, is back. He doesn't think they took their own lives. They were happy young women with no signs of problems. Meanwhile, life goes on at the Blend with a twice monthly event put on by a local church called Cappuccino Connection night. It is a way for people to meet potential romantic partners through five minute encounters. This 'speed dating' as well as online dating sites play a large part in this book. I know people have met great partners this way, but I think I'd rather be single than get involved in any of them. When our heroine Clare Cosi's daughter Joy becomes interested in the idea, Clare decides to attend to make sure the men are alright for her daughter, while saying she is doing it for herself. Much to her surprise, she does meet someone quite appealing. This meeting sets off a chain of events in which the Cappuccino Connection connects more than prospective couples. It also provides a connection to solving murders! I've noted before that a trait of some cozy mysteries is that the amateur sleuth gets herself into circumstances most of us would run away from. In the last book I was pretty happy because Clare didn't do this. In this book, however, she gets herself involved in what could have been a very dangerous situation. She believes in her own instincts and proceeds against the advice of Detective Quinn. I like it that she trusted herself, but I thought she was a bit too trusting in someone else. But still, I loved the book. I enjoy the people who work at the Blend and the customers who come in for coffee. And most of all I love Clare Cosi and her family and friends. She's a wonderful person and, as I said in the book report on the first book, she's someone you'd like to have as a friend. Now I shall show myself as the book geek I really am. Because Holiday Grind is the eighth in the series, and I like to read holiday books as December approaches, I have set myself a little Coffeehouse reading schedule. My plan is to read the third book in the series, Latte Trouble in January, Murder Most Frothy in March, Decaffeinated Corpse in May, French Pressed in July, Espresso Shot in September, and Holiday Grind in November. Then in 2013, I'll read Roast Mortem and the book I won in the drawing, Murder by Mocha. And probably there will be a new one coming out that year as well. This is my ninth book for the Foodie's Reading Challenge. If you are interested in food related books over several genres, please do visit here and click on the tabs at the top of the page. I meant to tell you that in addition to winning the drawing for Murder by Mocha, I also won this adorable cup and saucer! The company has an online store, if you are interested. This series has been bad for my pocketbook. In the first book I read about Kona coffee so thought I'd try some. Well, I'm here to say it is the smoothest, most delicious coffee I've ever tasted. But it is really expensive. I limit myself to a couple cups a week. This is the kind I've been buying. Short Stories on Wednesdays is a weekly event hosted here, at Bread Crumb Reads. The purpose of this event is to encourage people to read at least one short story a week. Published in Cosmopolitan, October 1973; and In the Looking Glass: Twenty-One Modern Short Stories by Women. N. Dean and M. Stark, eds. New York: Putnam, 1977. Much of my twenties and early thirties was spent reading Margaret Drabble's books. She was just a bit older than I, as were her heroines. Very seldom did my life intertwine with her characters, but I loved reading about them all the same. 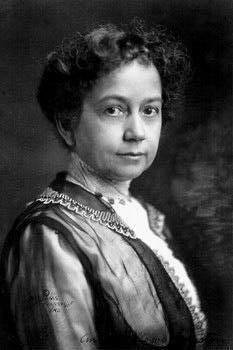 I stopped reading her work somewhere along the time she began writing what appeared to me to be more sociological or political works rather than the previous focus on the personal lives of women. And I may be wrong. Maybe her later writing was still personal and I was just too busy with little children to get as involved with her books as I had been earlier. I've been thinking of giving myself a little reading project of going back to her first book, and reading right through them because when I was reading A Summer Bird Cage and Jerusalem the Golden and The Waterfall I would have told anyone that Margaret Drabble was one of my favorite writers, possibly just below Virginia Woolf on my list. I'd like to know what my older self would think about these young women making their way. And I'd like to read the newer books as well. So, when I saw that this new book of her complete short stories was published, I bought it immediately. I also bought her sort-of memoir called The Pattern in the Carpet. I am reading it slowly and happily. She has always been very generous to me. I always make it perfectly clear to her that all she has to do if she wants to put me off is just give me a ring. I'm always in, I say. You're the busy one, not me, I'm a nobody, I always say: just you give me a ring if you can't manage Tuesday, we can easily fix another day. I'm always free. But she never does. The unnamed woman is a working, single mother with four children. She's always doing twenty things at once, and is quite distracted when our narrator goes to her house for the weekly supper and visit. The narrator is the kind of person who walks around to kill time so she won't arrive too early. The mother doesn't reveal much in her conversations. Mostly it is the narrator who talks. And she is full of hard luck stories. Meg reminds me of "Sad-Sack-Terziak" in the movie, Home For The Holidays. Terrible things happen to him, and always have. He'll say something like, I'm the one they call to fix the boiler on holidays because I don't have anyone to spend them with. Most of us are made uncomfortable by such blatant ourpourings of emotion. We don't know how to react. The speakers are so very lonely and we don't know how to cope with them. The woman in this story drinks. Gin and plenty of it on these Tuesday visits. She is clearly stretched to her limit, having worked outside all day, trying to cook a meal while the children all need her for one reason or another. She is quite sharp with them, and in this story shocks Meg by having quite an outburst at one of the children. But after Meg leaves, and looks back in the window, she sees the mother and son hugging one another and "laughing their heads off," which makes her think that the woman might be unbalanced and "could do with some kind of treatment." This reader wondered if they were laughing at poor, pathetic Meg. This is an excellent story by a writer who draws these characters perfectly. So perfectly that a reader might find them, especially Meg, achingly familiar. A book is like a door. Where I've not been before. What welcome there will be. I'm apt to spend the day. There's an old feed bucket that hangs in the barn. The chickens occasionally use it as a nest so Tom put some hay in to make it a bit softer. The egg on the left was laid by one of the new chickens. The one on the right was laid by one of the older chickens. In a couple weeks, the young ones' eggs will be the same size. 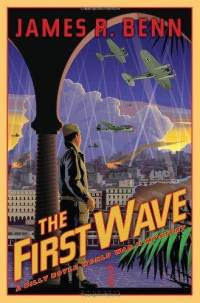 As I mentioned in my book report on the first book in the series, these World War II Billy Boyle stories are a bit like the television show, Foyle's War only with a young American soldier instead of an older English policeman. And while Foyle dealt with crimes at home during the War, Billy is overseas. I am a little surprised that I like this series so well. I'm not wild for war stories and most of the characters are men but still, I really like the books. I like Billy Boyle, Boston boy of Irish heritage who had just made detective (with some help). This time Billy Boyle is in French North Africa, in Vichy France territory. This is a picture of the real Operation Torch which our fictional hero was involved in. Once safely there, Billy gets involved in more French politics than he had imagined, and he has a hard time knowing who are the good guys. He meets Diana, the woman he fell in love with in the first book, in jail of all places. I'm not great with all the military strategy, but then again, Billy isn't so much either. Since he is a detective in civilian life, he detects in his military life. As in Foyle's War, there is a lot of regular crime going on in the midst of the war, and deaths occur which aren't directly caused by military action. 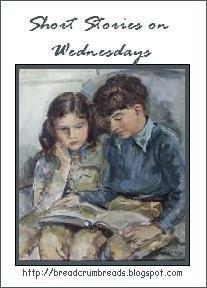 In this story, the reader and Billy learn a lot about the realities of being a woman in wartime. Their pay is lower than that of the men. They don't receive the same respect as men. And the same physical dangers which face them at home are equally threatening as they work in the arena of war. There were parts that were very difficult for me to read, and for Billy to deal with. As one setting is a field hospital, we learn the importance of the new wonder drug penicillin and the dangers of morphine. Billy's sometimes humorous narration offers relief from the dangers and cruelties of the situation. I smile when he refers to himself as 'Mrs. Boyle's boy.' I like the way he brings his police life to his work as a soldier. I had to notice everything around me, as if I were following a shooter up the rear stairway of a tenement with no backup. I was glad they were all here, and I thought about nights back in Boston when Dad and Uncle Dan had something going and the house would fill with cops, all watching out for each other. It felt good to be part of something that brought men like these together. Part of it was suffering ... It was the possibility of death that made men look each other in the eye, grip shoulders, give a nod that said Yes, I will risk everything for you. And though he is light-hearted, he has a more serious, philosophic outlook as well. I saw a few heads peek out of windows and doors and wondered what the locals were thinking. It might not make a whole lot of difference to them whether the French, Germans, Italians, or Americans ran the place. Whoever it was, they'd end up with the same short end of the stick. We might come as liberators, but we weren't planning to give the country back to the original owners. Billy Boyle is really a wonderful character, and I'd like to think that the author might bring him home to Boston after the war. 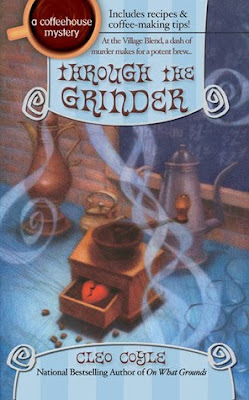 At this time there are six books in the series. I have number three waiting for me on the Kindle. Please visit here for this weekend's postings. and less than an hour later, voila! this. You may leave it unfrosted or use a buttercream frosting, either plain or chocolate. I sifted the dry ingredients together in a small bowl. Then I turned on the KitchenAid and let it stir the butter for a while, and then added the sugar, eggs, and vanilla. I added the milk and dry ingredients alternately. I baked it in a greased 9-inch round pan, in a preheated 350º F. oven for 45-55 minutes. That's it. Competition for cake mixes? You bet. Plus you put in the ingredients. No trans-fats or unpronounceables here. Basic, easy, delicious. Who could ask for more? Not me. Since I've never used a cake mix, I thought I'd offer a comparison of an easy homemade cake and a cake mix cake. I subscribe to the old adage, 'you are what you eat.' I figure we've just got one body and one life, so why not put only good things into the body to hopefully give us a longer, healthier life. As a dear old friend of ours used to say, 'I'm a day late, and a dollar short.' Just pretend it's Wednesday. I first heard of Hey Waitress and other stories by Helen Potrebenko here and was so impressed that I bought a second hand copy online. As I read this story, I thought often of Counter Culture: The American Coffee Shop Waitress. Hey Waitress is about Stella Sutcliffe and her daughter Ginny who live in an inexpensive rental house in Vancouver. They are very close, in that way I've always imagined single mothers and their daughters to be. Stella is on break from university and finding it hard to get a job for that short a time. The trouble was that with about half a million unemployed in the province, no one was very excited about a job applicant who had just completed first year English at university and wanted a job only until the next term started. Stella had worked and scrimped with a single-minded obsession so Ginny could go to school but she was unable to provide the network that was as essential as the schooling. ... have you ever worked in a restaurant designed to be one? Look at the way the Sea Prince kitchen is on a different level and you have to lug trays up and down stairs. It seems as if every restaurant was originally built to be something else and then became a restaurant. ... instead of replacing her, Dalton had hired another waitress and changed the rules so the waitresses collected the cash. It was, in effect, a drop in wages since the cashier/waitresses now had to cover the cost of customers who left without paying since they were handing their own cash. One place I worked the manager would look over my bills and charge me for coffee every time customers hadn't ordered coffee, or dessert. ... I had to pay it out of my tips. Over time, Ginny meets a guy and thinks she is in love. He's a drug dealer, and eventually Ginny moves out and she and her mother become estranged for a while. Other than that guy, the characters in this story are good and decent people. They work hard, they don't complain, they want the best for their children. It is one of the best stories I've ever read. It's about real people. People you see, or don't see, every day. Waitresses are like baseball players, only without the million dollar salaries. All those people, Ginny mused. Dreaming of other things. What's wrong with waitressing? It's just the attitude people have. And that attitude would change in a split second if waitresses got decent pay. I loved this story. I love this writer. I've read one other story in the book which I'll write about sometime. Helen Potrebenko tells a good tale, with honesty and a bit of humor. You don't feel sorry for her characters because they don't feel sorry for themselves. They get on with life, regardless of what that life may bring. Fiction doesn't get better than this. Helen Potrebenko has a blog of her writing, but it hasn't been updated since last year. Too bad because it was good. It has poems and stories by her. I know that I'm going to try and buy everything she has written. She is a stellar writer. Hey Waitress, first story. 31 pages long. Collection published 1989. This is one of the oddest little tales I've read. It takes place in Kiev, Ukraine after the end of the USSR. Our main character, Viktor got his penguin, Misha when the zoo was getting rid of animals to save money. He takes cold baths in the tub and eats frozen fish and occasionally snuggles against Viktor's knee. But Misha suffers from 'depressive syndrome' and from heart trouble as a result of it. Viktor learns this from Pidpaly, an old man who knows everything about penguins. He tells Viktor that the best thing he can do for Misha is to bring him where he belongs. Imagine the torment of living where it's up to 40º+ in summer and occasionally down to -10º in winter, when you've got two layers of fat protecting you against intense cold, to say nothing of hundreds of blood vessels doing the same. Just imagine: you get superheated internally. You burn up … Practically all penguins living in zoos exhibit depressive syndrome. …two complementary lonelinesses, creating an impression more of interdependence than of amity. those extra-CV details which, like fine Indian spices, transform an obelisk of sad, established fact into a gourmet dish. One day a man calls saying he was referred to Viktor by the newspaper editor. He requests an obituary for a friend who is ill. The man's name is Misha, so from then forward Viktor thinks of him as 'Misha-non-penguin.' He offers the prospect of more work. We also meet a 'miliatiaman' who agrees to come by and take care of Misha when Viktor must go to another town to collect some information for the newspaper. Viktor asks him because one, he has no friends, and two, because he is reminded of an old joke about a militiaman and a penguin. This joke is at the very beginning of the book. 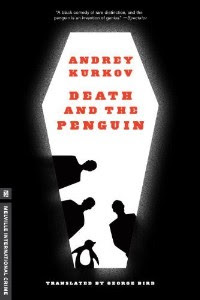 I'll repeat it here because, in a way, its oddness and wry humor typify the whole of Death and the Penguin. A Militia major is driving along when he sees a militiaman standing with a penguin. "Take him to the zoo," he orders. Some time later the same major is driving along when he sees the militiaman still with the penguin. "What have you been doing?" he asks. "I said take him to the zoo." When Viktor tells Misha-non-penguin that he never gets to read the obituaries he has written because the people don't die, the next day one does, a mobster type. There's clearly something going on here that Viktor doesn't understand. A little girl is dropped off by her father (Misha-non-penguin) for Viktor to take care of, along with a substantial amount of money. This money allows Viktor to hire a nanny, Nina who is the niece of the militiaman, and suddenly lonely Viktor has a little family of man, woman, child, and penguin. At one point in the book, some guys want Misha (the penguin) to attend funerals. Whoa. What is this all about? And by the end I still wasn't sure. But I liked it. I want to read Penguin Lost to find out more about Misha and Viktor. If you find any of these passages intriguing, and if they appeal to your sense of humor please do give the book a try. I can quite guarantee you've never read anything like it! It was generally felt that he "knew a little too much about everybody," and he certainly knew something about the lives of Anne Meredith, Dr. Roberts, Mrs. Lorrimer, and Major John Despard, for they all in some way feared him. The two groups play bridge in two separate rooms, while their host sits by the fire in the room with the alleged killers. What was he thinking, I wondered?! And sure enough, the slimy fellow is stabbed with a dagger which was displayed in the very room. Now the problem is who on earth could have killed him? Wouldn't it be noticed if one of the players got up and went over to Mr. Shaitana? 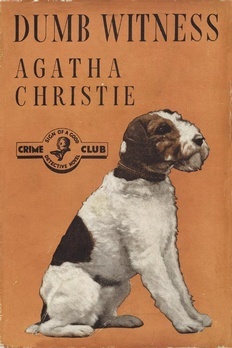 Hercule Poirot considered the Shaitana murder one of his favourite cases but that, when he described it to Captain Hastings, his friend thought it very dull. In the way many people felt Sherlock Holmes and Doctor Watson to be real people, Agatha lets her readers think that just maybe Hercule and Arthur are real as well. I was a little leery that I would feel lost in the book, not being a bridge player but I should have trusted that the author wouldn't do that to a non-playing reader. Yes, the strategies of bridge are an important and interesting part of the mystery, but I did okay just understanding them from Poirot's point of view. This is a very intelligent story, and I thought it was most excellent. The author was brilliant, that's all. 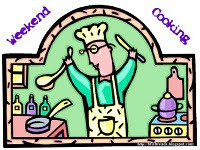 Please visit Beth Fish Reads for more weekend cooking. This is an easy, delicious coffee cake for breakfast or supper or with coffee. Preheat oven to 350 degrees F. Lightly grease an 8"x 8" pan. In another bowl combine sour cream, eggs, butter, and vanilla, mixing well. Add the sifted ingredients to the sour cream mixture. Stir just until all the dry ingredients are moistened. Bake at 350 F. for about 25-30 minutes or until browned and cake is beginning to pull away from sides of pan. Let cake cool in pan. Serve while slightly warm or cold. and even a bit about lock smithing. A perfect book for me is when I get involved in the story and the characters, but also learn something new, and The Lake of Dreams fits the bill. I loved it so much that I bought my own copy. It is for sale at Amazon for under $6 in hardcover. Lucy Jarrett is in her late-twenties. The defining moment of her life is the loss of her father when she was 17. Lucy's grief over her father's drowning death is magnified because she feels guilt and responsibility. The night it happened she had just gotten home from a date with her then-boyfriend, Keegan Fall. My father was out in the garden when I turned toward the house. Moonlight caught the gray in his short hair; the tip of his cigarette burned, rising, falling. Lilacs and early roses floated in the darkness. Nice of you to show up, my father said. I'm sorry you worried, I told him. A silence, the scents of lake water and compost and green shoots splitting open the dark earth, and then he said, Want to go fishing with me, Lucy? How about it? It's been a long time. His words were wistful, and I remembered getting up before dawn to meet him, struggling to carry the tackle box as we crossed the lawn to the boat. I wanted to go fishing, to accept my father's invitation, but I wanted more to go upstairs to think about Keegan Fall. So I turned away, and in a tone as sharp as broken shells, I said, Dad. Really. I'm hardly little anymore. Those were the last words I ever spoke to him. Hours later, waking to sunlight and urgent voices, I ran downstairs and across the dew-struck lawn to the shore, where they had pulled my father from the lake. … thoughts which have never left me: If I'd gone. If I'd been there. If only I'd said yes. "Besides my mother's condition isn't serious. It's not exactly an emergency situation." "Sometimes loneliness is an emergency situation, Lucy. … lately you seem like a very sad and lonely person, that's all." I found myself thinking about people who work too hard, too constantly to keep such feelings at bay. It is only when we stop that our true emotions have a chance to come to the forefront. So, Lucy does go home with Yoshi planning to join her in a couple weeks. She goes back to this house and garden which was described here. She happens onto some old letters and newspaper clippings which set her off on a journey of discovery about her family, and herself along the way. She gets a chance to rethink events from the past with an older perspective. She finds deep and sometimes upsettling truths. Not until Lucy returned and went further back into a family history she didn't even knew existed, could she come to terms with her life before and after her father died. If you are like me and do not like to read about terrible family secrets which so often involve abuse and terror, I reassure you that these horrors are not in this book. The image of the woman was stylized. She was tall and thin, and she gazed down at her cupped hands. Her auburn hair, piled on top of her head, escaped in tendrils; her dress was deep blue, falling to her ankles, her arms and feet were a pearly opalescent white. She was looking down at three pale blue eggs in her palms and her eyes seemed almost closed. The air smelled of dust and old paper. Rows and rows of books lined the shelves and I let my eyes linger on the sturdy spines, thinking how human books were, so full of ideas and images, worlds imagined, worlds perceived; full of fingerprints and sudden laughter and the sighs of readers, too. It was humbling to consider all these authors, struggling with this word or that phrase, recording their thoughts for people they'd never meet. It was this very passage which Marcia posted on her Owl's Feathers blog which made me get the book and read it. 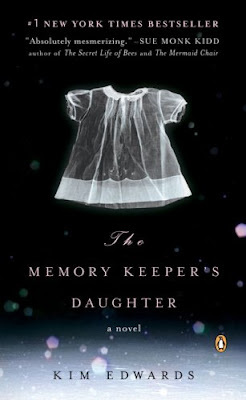 The novel is the author's first book, The Memory Keeper's Daughter, which I haven't read yet, but hope to. When I finished this book, I was in the living room, alone in the house save for Sadie and Raya with the west light coming in through the porch door, the evening sun spotlighting the leaves of the trees off the porch. The air was clear and cool enough to wear a sweatshirt with all the windows open. Life just seemed so perfect, so right at that time that I wanted to make note of it. You may see a video interview with Kim Edwards here. It is about 11 minutes long, and really quite wonderful.